The confusion is perhaps understandable. 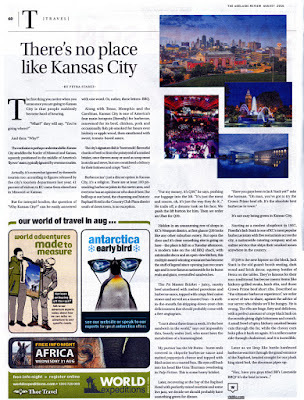 Kansas City straddles the border of Missouri and Kansas, squarely positioned in the middle of America’s ‘flyover’ states, typically ignored by overseas tourists. 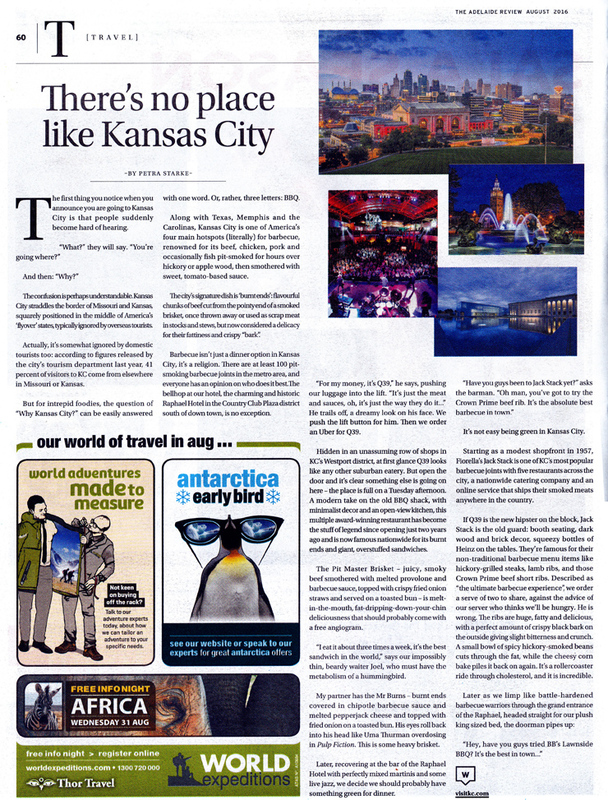 Actually, it’s somewhat ignored by domestic tourists too: according to figures released by the city’s tourism department last year, 41 percent of visitors to KC come from elsewhere in Missouri or Kansas. But for intrepid foodies, the question of “Why Kansas City?” can be easily answered with one word. Or, rather, three letters: BBQ. Along with Texas, Memphis and the Carolinas, Kansas City is one of America’s four main hotspots (literally) for barbecue, renowned for its beef, chicken, pork and occasionally fish pit smoked for hours over hickory or apple wood, then smothered with sweet, tomato-based sauce. The city’s signature dish is ‘burnt ends’: flavourful chunks of beef cut from the pointy end of a smoked brisket, once thrown away or used as scrap meat in stocks and stews, but now considered a delicacy for their fattiness and crispy “bark”. Barbecue isn’t just a dinner option in Kansas City, it’s a religion. There are at least 100 pitsmoking barbecue joints in the metro area, and everyone has an opinion on who does it best. The bellhop at our hotel, the charming and historic Raphael Hotel in the Country Club Plaza district south of down town, is no exception. He trails off, a dreamy look on his face. We push the lift button for him. Then we order an Uber for Q39. Hidden in an unassuming row of shops in KC’s Westport district, at first glance Q39 looks like any other suburban eatery. But open the door and it’s clear something else is going on here – the place is full on a Tuesday afternoon. A modern take on the old BBQ shack, with minimalist decor and an open-view kitchen, this multiple award-winning restaurant has become the stuff of legend since opening just two years ago and is now famous nationwide for its burnt ends and giant, overstuffed sandwiches. The Pit Master Brisket – juicy, smoky beef smothered with melted provolone and barbecue sauce, topped with crispy fried onion straws and served on a toasted bun – is melt-in-the-mouth, fat-dripping-down-your-chin deliciousness that should probably come with a free angiogram. “I eat it about three times a week, it’s the best sandwich in the world,” says our impossibly thin, beardy waiter Joel, who must have the metabolism of a hummingbird. My partner has the Mr Burns – burnt ends covered in chipotle barbecue sauce and melted pepperjack cheese and topped with fried onion on a toasted bun. His eyes roll back into his head like Uma Thurman overdosing in Pulp Fiction. This is some heavy brisket. Later, recovering at the bar of the Raphael Hotel with perfectly mixed martinis and some live jazz, we decide we should probably have something green for dinner. It’s not easy being green in Kansas City. Starting as a modest shopfront in 1957, Fiorella’s Jack Stack is one of KC’s most popular barbecue joints with five restaurants across the city, a nationwide catering company and an online service that ships their smoked meats anywhere in the country. If Q39 is the new hipster on the block, Jack Stack is the old guard: booth seating, dark wood and brick decor, squeezy bottles of Heinz on the tables. They’re famous for their non-traditional barbecue menu items like hickory-grilled steaks, lamb ribs, and those Crown Prime beef short ribs. Described as “the ultimate barbecue experience”, we order a serve of two to share, against the advice of our server who thinks we’ll be hungry. He is wrong. The ribs are huge, fatty and delicious, with a perfect amount of crispy black bark on the outside giving slight bitterness and crunch. A small bowl of spicy hickory-smoked beans cuts through the fat, while the cheesy corn bake piles it back on again. It’s a rollercoaster ride through cholesterol, and it is incredible.